For some interiors, a bulky and heavy shelving unit can make the space and lightness of the room seem to disappear. The wall vanishes and you’re left with a hefty shape adding weight to the ambiance of the living room or bedroom. However, if you’re looking for a large display furniture piece which doesn’t overwhelm a room then you might want to have a second look at this contemporary Blu Dot Chicago 8 box shelving unit which puts negative space to good use. The Blu Dot features a collection of eight wooden boxes, available in a variety of different woods, framed together with tubular steel legs. They are formed in such a way that both the interior of each box and it’s ceiling-facing side act as shelf surfaces ideal for the placement of books, decorative ornaments, vases of flowers, and photographs. Positive and negative space is put to good use and the result is a large yet unobtrusive shelving unit ready to fit into a modern and stylish apartment. It is ideal for smaller interior spaces as well which will benefit from the elegant design. There is plenty of surface area on which to put your favourite items. Some will look better within a box whilst others will be more suited to an open-space surface. The good quality construction adds to the attractive nature of the unit which will look good in a multitude of different interiors in the home. The living room is an obvious choice but it will also be a good quality item for a home study/office/library. Here it will provide shelving for objects related to a home-based business and/or a regular hobby. It will also complement existing wooden furniture of a similar style such as desks, tables, beds, and cabinets. As previous buyers have noted, it does come in separate parts but it is very easy to assemble. You can buy it from here: Blu Dot Chicago 8 Box Shelving Unit. Overall Dimensions: 74.5″ H x 94″ W x 12″ D.
The elegant bookcase shelving unit, as seen below, is a perfect furniture piece for stylish interiors which might include a living room, home library or study area. Consisting of five tiers, the black ebony bookshelf is structured rather like a pyramid with longer shelves at the bottom and shorter shelves at the top. The free-standing and open-backed bookcase feature allows for placement in a great range of locations, whether against a wall or in the center of a room. 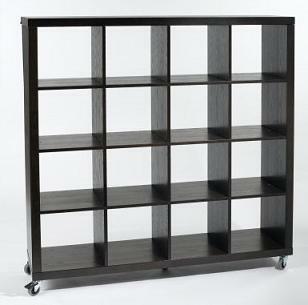 It’s not just books that can find a home on this elegant ebony bookcase. One can place all sorts of items on the shelves, including decorative objects, plants, photographs, candles and even folded clothing depending on where the 5 tiered shelving unit is placed. The openness of the bookshelf means it can be situated in any number of positions including behind a sofa, at the end of a bed, as a room divider or alternatively in a regular location against a dining room or hallway wall. The beautiful style of the bookshelf unit hints at the delightful period pieces of yesteryear, with the exquisite and graceful columns that adorn each of the four corners, on each of the individual tiers. If you have matching furniture in a room already in a similar style to these, then this 5 tiered black ebony bookshelf in a decidedly pyramid format will make an excellent addition to that interior. 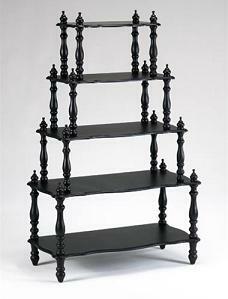 You can buy this piece here: 5 Tiered Ebony Bookshelf. 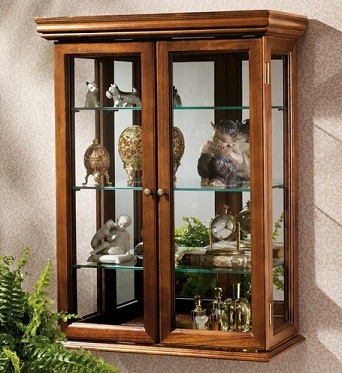 A cherry corner curio cabinet is a good furniture choice for a dining room or living room interior. This is especially true if the interior in question is smaller than desired and a display feature is required. Instead of a regular bulky cabinet placed against a wall and getting in the way of the dining room chairs, a corner curio cabinet like the one pictured below uses the spare and often much under-used space in a corner. The best use of floor space is thus used whilst at the same time providing an attractive and functional display feature. In rooms such as the main living area, the wood and glass corner cabinet can be complimented with existing cherry wood furniture items and interior décor. Two situated in each corner of a living room can add extra display surfaces as well as a matching balance which will enhance the interior. This particular cherry corner curio cabinet is ideal for the storage of decorative curio objects such as unique plates, sculptures, vases, statues and jewellery. The glass casing allows for the artistic items to be seen from anywhere in the room. Made from select hardwoods and veneers, this elegant vertical cherry corner curio cabinet is designed especially to showcase and highlight your very best decorative objects. Glass shelves allow the sculptures or china to be seen from above and below whilst also giving much needed access to natural daylight and any artificial lighting. An interior light is located on the roof of the cabinet so as to create a special light effect regardless of any low-level light in the rest of the room. A glass-mirrored back adds an extra dimension to the showcase feature as well as to the rest of the interior. The cherry corner curio cabinet also comes with a secure padlock which prevents children especially from opening the cabinet and accidentally knocking precious items off the shelves. The glass doors also prevent the excess built up of dust whilst at the same time allowing the decorative items to be seen in all their glory. No longer will you need to worry above empty corners that need filling with flowers or small tables. This corner cabinet will bring a wonderfully eye-catching storage and display feature to any interior space. It will also provide a great opportunity to bring out all that stored-away china and art you were wondering how to showcase. You can buy this cabinet from here: Cherry Corner Curio Cabinet. 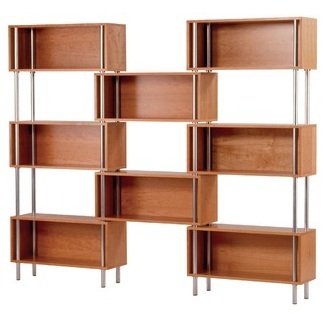 I brought a very similar version of this bookcase on wheels a couple of years ago and it has been a wonderful addition to my living room. Few bookcases are more perfect than this Eurostyle Sage Bookcase for the job of displaying small sculptures, books, photographs and even flowers. It can be used either as a regular bookshelf is against a wall or even in the center of a large room, kind of like a room divider. I personally use it in a similar way to a regular bookshelf and it works wonders. On three of the twelve enclosed shelves I have placed books. A couple of others provide absolutely delightful little cat bed frames with a small cushion inside so the cat can leap up and sleep there during the day or night. On the other shelves I’ve placed various small artistic ornaments and keep-sakes as well as a number of stand-alone picture frames. On the top of this bookcase on wheels with 12 enclosed shelves, I have a large basket filled with dried branches which reach right up to the ceiling (which is high). You can fill your enclosed spaces with similar things. All in all, you can present a beautiful array of color, shapes, accessories and important memories all in one place where the whole family can admire them. If you get tired of it being in one location, then you can just move the bookcase on wheels by simply pushing it gently to another area of the room or house. The backless sections of the enclosed shelves means you can place table lamps or accent lights very easily onto one or more shelves thereby providing a beautiful ambient setting during the evening and night. You can buy this impressive bookcase from the following location: Eurostyle Sage Bookcase on Wheels With 12 Enclosed Shelves.